Located in the heart of Harvard Square, the gallery provides a stellar site of intellectual engagement for the research institutes and archives of the Hutchins Center, interdisciplinary arts initiatives across Harvard University, and artistic inquiry and engagement of the public art communities of Cambridge, greater Boston and beyond. Designed by renowned architect and innovator David Adjaye of Adjaye Associates, the Cooper Gallery includes 2,300 square feet of exhibition space and state-of-the-art auxiliary spaces for seminars, conferences, and educational programming. The gallery is made possible by the generous support of Liberian entrepreneur and philanthropist, Ethelbert Cooper. Mr Cooper is an African entrepreneur who has been active in the African and international natural resources sector for just under four decades. His career commenced with an early involvement in the mining sector of Liberia in the 1970s, when he served as a young adviser to the nation’s finance minister. During the 1980s and early 1990s, Mr Cooper was the lead protagonist in the successful phased ownership and management restructuring of Liberia’s largest industrial project, the Lamco Joint Venture iron ore mining project. During that period, a separate company of Mr Cooper’s created and implemented an innovative program to export a value-added product, direct reduced iron (“DRI”), from Nigeria to European steelmakers, employing Liberian iron ore as feedstock. In the latter half of the 1990s and early 2000s, Mr Cooper devoted most of his professional efforts to black-economic-empowerment, and related financial-services, shipping, and internet ventures in South Africa and Malaysia. Commencing in 2004, Mr Cooper was the principal founder of a London-based, Africa-focused, oil and gas exploration and production company, Afren plc, a large enterprise which, at its peak, produced 50,000 barrels of oil per day, held assets in twelve countries in Africa and the Middle East, and had a stock market capitalization of up to US$3 billion. Mr Cooper’s hands-on involvement in Afren ended in 2011, long before management problems and the global fall-off in crude oil prices caused the company’s closure in 2015. Since 2006, Mr Cooper has directed the evolution of Gasol plc, another London-based company which is building an LNG regasification terminal in Benin, linked to electricity generation and transmission facilities in Benin and the neighbouring Lagos, Nigeria market. Gasol also successfully pioneered the establishment of a new gas-fired electric power station and LNG import terminal in Malta, a project stake Gasol subsequently sold to refocus on its core West African activities. Since 2011, Mr Cooper has also been the key player in International Mining & Infrastructure Corporation plc (“IMIC”), a London-based company which is developing major iron ore projects in in Cameroon. Presently, Mr Cooper and his team are evaluating the establishment of an integrated iron-making complex in Cameroon, to benefit from the availability of abundant iron ore from IMIC and local natural gas supplies, and produce value-added products for export. In addition, a U.S-based company sponsored by Mr Cooper International Metallics Corporation (“IMC”), is developing a merchant hot briquetted iron (“HBI”) plant, as well as the potential acquisition of an existing iron ore pellet plant, in the province of Quebec, Canada. A formal launch ceremony for the US$850 million HBI project was recently held at the plant site in Quebec, relevant studies have been completed, and efforts to assemble equity and debt funding have considerable momentum. Elsewhere in his public life, Mr Cooper is a member of the Advisory Board of the Hutchins Center for African & African American Research at Harvard University, and he is a member of the President’s Council of International Advisors and of the renowned Sterling Fellows at Yale University. 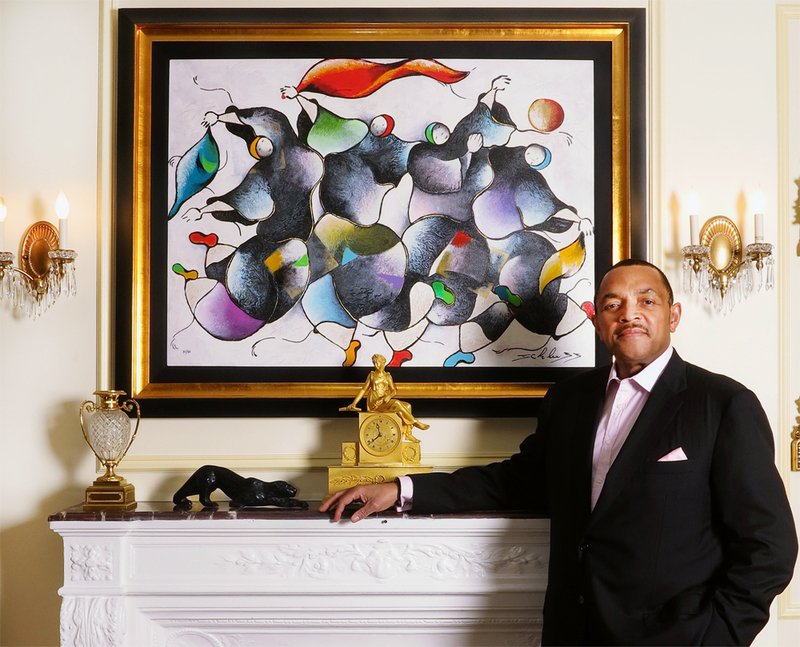 At Harvard, Mr Cooper has directly sponsored the creation of the Ethelbert Cooper Gallery of African & African American Art at the Hutchins Center. In 2015, he was awarded the prestigious WEB Du Bois Medal, Harvard's highest honor to individuals who have made exceptional contributions to the field of African and African American Studies. At Yale, Mr Cooper has personally endowed the Yale Africa scholarship fund for deserving African students, with an initial founding grant – more African students now attend Yale than ever in the University’s history. The Hutchins Center for African & African American Research supports research on the history and culture of people of African descent the world over and provides a forum for collaboration and the ongoing exchange of ideas. It seeks to stimulate scholarly engagement in African and African American studies both at Harvard and beyond, and to increase public awareness and understanding of this vital field of study. As the preeminent research center in the field, the Hutchins Center sponsors visiting fellows, art exhibitions, publications, research projects, archives, readings, conferences, and new media initiatives that respond to and excite interest in established and emerging channels of inquiry in African and African American research.